I'm pretty sure they had orange, strawberry, grape and cola. Thought the cola was nasty. Flavored ("Flav-R") straws -- one of the flavors was chocolate. One of my late aunts, a Dominican sister, turned us kids onto Fizzies...Fizzies weren't 'soda' so we could have them once inna while...they were a cool gimmick...kimda like flavored Alka Seltzer without the salty taste...liked those along with the flavored straws you used in milk...if anyone remembers THOSE!!! Wow, I remember these. They used to be an "impulse" item at the local Kash n' Karry. On the display at the check out with other candies. My sister & I would pick them up while mom was putting the groceries on the conveyor belt for check out. We used to EAT them right there in the line. i received a fizzie soda fountain machine for christmas in 1959...i loved it even tho everything including me got sticky when the soda fountain spewed out fizzies in all directions.....lol great memories! While my mother bought these often, most of us thought they were awful. The Alka-Seltzer effect was fun but they were solid saccharine tablets and extremely cloying. My favorite was Cola, though. 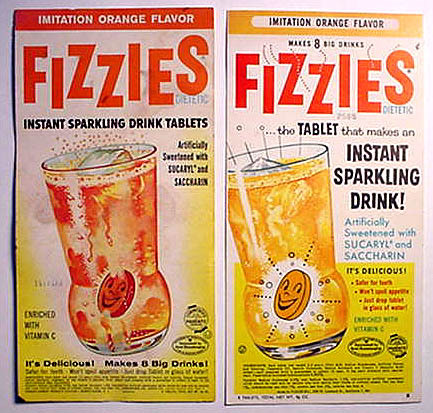 All I remeber about Fizzies is that they tasted like Alka-Seltzer! now i remember they were a tablet you dropped in a glass of water to make a cool drink.